Rand Paul says Donald Trump is a “fake conservative” and it’s time for all the other Republicans running for president to “quit being shy” and take Trump on. Paul spoke to a crowd of about 500 students on the Iowa State University campus this evening. During his speech, Paul rapped Trump for favoring the use of the government’s eminent domain power to seize property for building one of Trump’s Atlantic City casinos. Later, Paul told reporters there’s not “one conservative in America” who favors letting government “thugs” take property from smaller owners so “big corporate owners” like Trump can use it. “People are going to start to say to themselves: ‘Oh my goodness, maybe this sort of bizarre fandom, by even the media, could lead to a selection process that isn’t the best for the country,” Paul said. Paul and Trump will be among the 11 GOP candidates who will share the stage next week during a nationally televised debate and Paul suggests he’s ready to challenge Trump directly if given the opportunity. Paul is campaigning in Iowa this weekend. His campaign announced tonight there are now “Stand with Paul” chapters at 300 college campuses around the country, including 15 in Iowa. 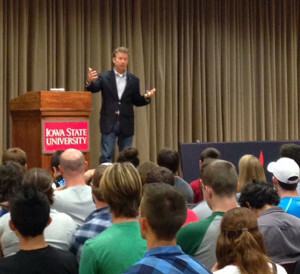 The Paul campaign aims to get 10,000 students at those Iowa colleges and universities to caucus for Paul on February 1………….